First there was The Bee Movie, which gave us a ‘bee’s eye view’ of how critical the pollination process is to our world. Then there was the Honey Latte at Starbucks. Which showcases honey as a premium ingredient. Burt’s Bees, which has been around for quite some time, made a public service announcement in November. I’m not the only one who has noticed. It seems that our honey bees are in trouble, and if we don’t do something to help, it could significantly impact many agricultural crops. Almonds, for example, rely 100% on honey bees to pollinate their flowers. So how can you help? PBS has some great suggestions. You can also buy Haagan Dazs ice cream. There could be worse things. A portion of the proceeds from the sale of the new flavor and all HD loves HB tagged flavors will be used to fund the $250,000 donation to UC Davis and Penn State. In fact, if you visit a participating Haagan Daas store on May 13th, you can get a free scoop of Vanilla Honey Bee ice cream! 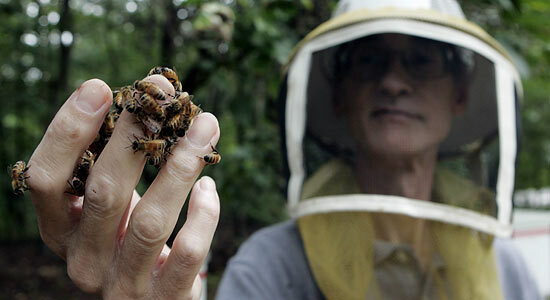 Visit the Haagan Daas Loves Honeybees site for a complete press kit that includes lots of interesting information.